One of the staples of any Italian Christmas Eve dinner is the feast of the seven fishes. This tradition originally started because of the Roman Catholic custom of abstaining from meat on Fridays and on specific holy days. It is actually unclear when the tradition of the feast of the seven fishes first began. There is a strong possibility that it may even have started in restaurants. Although different families serve different fish on this day, known as La Viglia, there are a few key staples that really make an Italian Christmas Eve dinner. The dinner usually includes whiting, clams, mussels, and baccala. Many people serve seven courses for the seven sacraments. However, some families do even more such as ten for the stations of the cross or even twelve or thirteen for the apostles and Jesus! Most Italians also recommend pairing this feast with lots of wine! 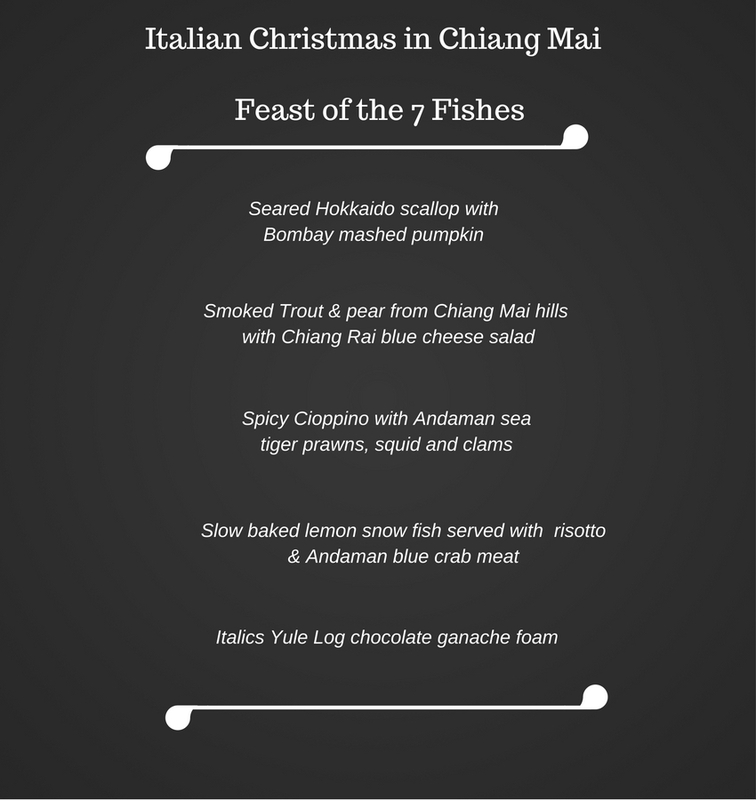 At Akyra Manor Hotel in Chiang Mai, we'll be serving a Christmas Eve seven fish feast like you've never seen or tasted before. The first course should generally be on the lighter side. You have at least six more dishes to go so you will want to pace yourself to ensure you and your guests do not get too full too quickly. Serving a fish based dip with toasted bread and drizzled oil can be a great way to get this feast started. Some recommended dishes include whipped baccala, salmon rillette, or smoked trout dip. If you are enjoying your feast while dining out, many restaurants will start with an amuse bouche, which is a tiny, single serving hors d'oeuvre that the chef hand selects and that is exactly what you will be receiving at Italics Restaurant. We will be serving a delicious seared hokkaido scallop with bombay mashed pumpkin that should not be missed. Hokkaido scallops are the most desirable scallops in East Asia and most chefs prefer them over any other type of scallop, especially when being used in a sushi dish. They are sweet in flavor and they are delicious served either raw or lightly sauteed. Due to the natural habitat of these fish being in freezing cold water, the taste is particularly unique and appealing. The next course is typically still on the lighter side and is often a salad. Many Italians might do a cold seafood salad paired with squid or even trout. At Italics Restaurant, the starter course will be smoked trout and pear from the Chiang Mai hills royal project foundation with Chiang Rai blue cheese salad. This is clearly a Thai twist on the traditional Italian meal as it pays homage to both Chiang Mai and Chiang Rai. Trout is a great fish to smoke and they can easily be used as a flavor addition to many soups, salads, and dips. This one of a kind dish brings together an extensive combination of flavors between the smoked trout, pears, and blue cheese salad, and it is not to be missed. Italian will start their next course with something hearty. A fish soup or stew is always a really great idea. At the Akyra Manor, we will be serving spicy cioppino with Andaman sea tiger prawns, squids, and clams. Cioppino is a fish stew that appears to have originated in San Francisco, California. It is widely regarded as an Italian-American dish made with various types of seafood. Clams, mussels, shrimp, and fish fillets are some of the most popular ingredients used to create a delicious cioppino. In this particular cioppino served at the Akyra, there will be sea tiger prawns right from the Andaman sea. 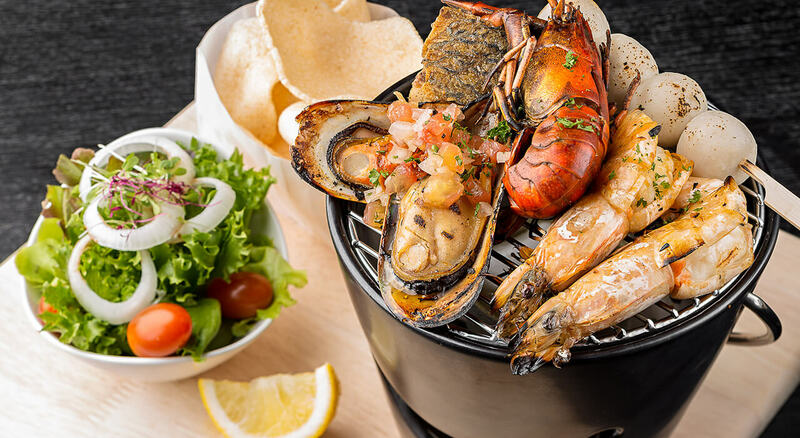 This scrumptious shellfish is also known as salt prawn, giant prawn, and various other names and is very popular Asian cuisine, particularly in Thailand. This is just another example of the Italian Thai fusion you will get to enjoy at this Christmas feast. They are generally large in size for shellfish and are very similar in taste and size to a typical shrimp, but cooked in this cioppino, they are really something special and not to be missed. In addition to the sea prawn, this soup contains clams and squid, common staples in this Italian dish. All these delicious ingredients are simmered in a tomato sauce, allowing the flavors to really blend. Cioppino is often served as a spicy dish and red pepper flakes and other seasonings are often added to give the meal that extra kick. The fourth and fifth courses are usually main dishes often served with pasta or rice. A traditional Italian menu might serve a delicious spaghetti with clams. However, at the Akyra Manor, we are serving a slow baked lemon snow fish with a truffle risotto and Andaman blue crab meat so you get an amazing opportunity to taste the local Thai cuisine. Snow fish is often short in demand in Thailand because it is such a popular dish, so it is a real treat to get to enjoy it this Christmas Eve. Snow fish is also known as sable fish, black cod, or butter fish. It is considered a delicacy in many countries. The fish has a white, fleshy exterior and a mild fishy flavor. It is similar in texture and taste to Chilean sea bass. Additionally, it is high in omega 3 fatty acids which are necessary for metabolism in the human body so you can feel good about what you are putting in your body as you indulge! The snow fish we are serving is slow baked and has a delicious lemon flavor. It is served with a truffle risotto. Risotto is a traditional meal that originally comes from Northern Italy and is rice cooked in a broth until it forms a tasty, creamy consistency. It is one of the most common and traditional Italian rice dishes and is particularly appetising in this truffle dish, which is one of the most expensive and desirable mushrooms available. As if the slow baked lemon snow fish with truffle risotto was not enough, the main course also comes with Andaman blue crab meat in it. The blue crab meat is just another fish option to add to this seven fish feast. The Japanese blue crab is one of the most widely fished species in the world and the meat is just mouth watering. The last, but certainly not least, course of the night will be dessert! Italian cookies are always a great option, as are traditional Italian cannolis. Cannolis are a unique pastry that come from Sicily and are tube-shaped fried pastry dough filled with a sweet, creamy filling. At the Akyra Manor, we will be serving a similar dessert known as the Italics Yule Log, a one of a kind treat for you to enjoy after indulging in all those fish dishes. Additionally, this dessert will be served with a chocolate ganache foam. Ganache is made from chocolate and heavy cream. You usually make it by first heating the cream and then pouring in the chocolate and whisking it together. Afterwards, the ganache mixture must cool and then it will be ready to serve with this delicious dessert! Italics will serve an amuse bouche, starter, soup, and main course, followed by dessert. 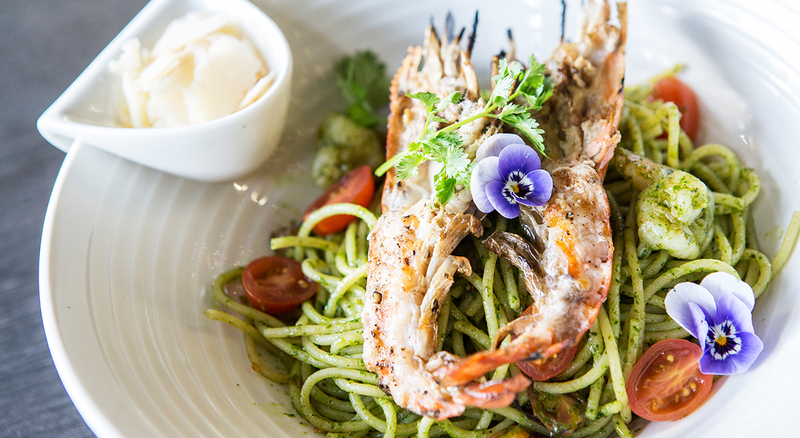 It is clear this is a one of the kind Italian cuisine with a Thai twist that should not be missed.